The ecosystems of the world are linked by birds. Nowhere is that more apparent than in the Arctic National Wildlife Refuge, where more than 190 species converge, from six continents and all fifty states, to nest and rear their young in the twenty-four-hour summer daylight. 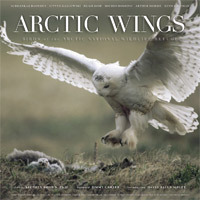 Arctic Wings reveals the importance of the Refuge to world bird populations and explores the potentially dire consequences of allowing oil exploration within its boundaries. A traveling exhibit, “Arctic Wings: Miracle of Migration,” curated by the Burke Museum of Natural History and Culture in Seattle, reached over 70,000 people from 2011 to 2014.